In comparison to some of the other Little Black Classics disasters I’ve encountered, I fairly enjoyed this one. The mad king of Persia and his manic actions make for an interesting read, particularly the steps he takes in response to dreams, or the comments of oracles. What’s meaningful here is the moment Cambyses discovers he’s dying, and goes on to realise he was completely misguided in one of his deranged acts. There was something really poignant in this for me. 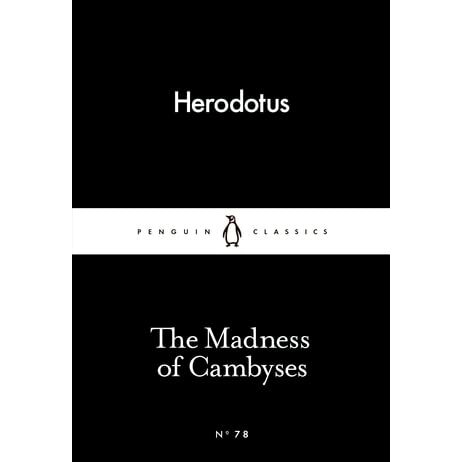 Accounts of historic custom were also incredibly enlightening, as were the ponderings of Herodotus. My only irritation was the huge number of names and places mentioned, which made things slightly difficult to keep track of. God, I love a mad king.